Just a quick reminder that our early bird promo for the upcoming Bangkok Summit will be ending soon. 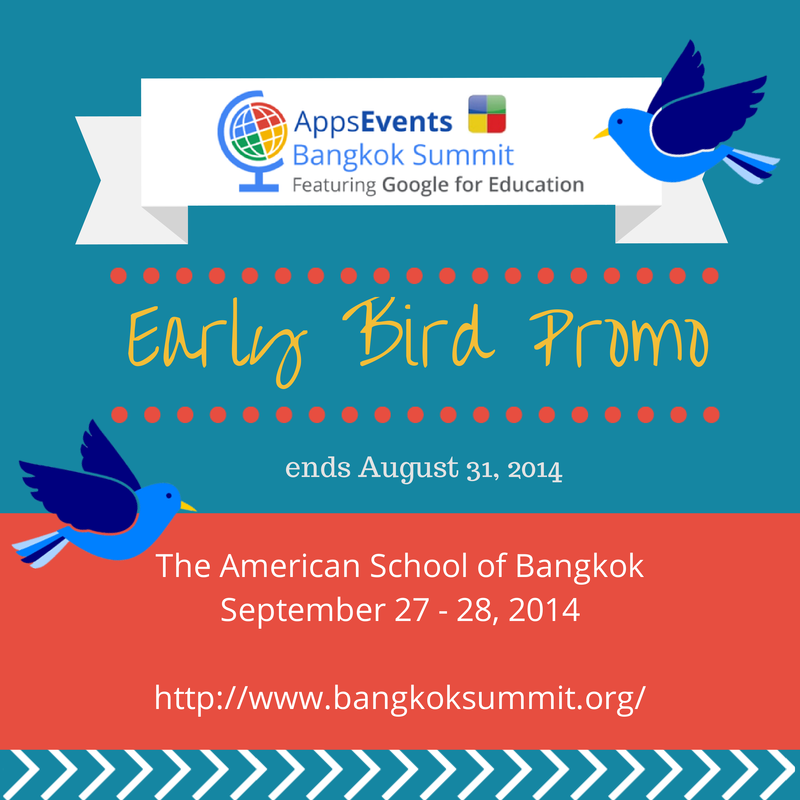 The Summit will be an exciting two day event taking place at The American School of Bangkok on Saturday, September 27 until Sunday, September 28, 2014. We have some truly world-class speakers to join us this year and have prepared fantastic sessions focused on helping teachers and educators like you to get the most out of the Google Apps for Education suite. We have two speakers flying in from the US to Bangkok just for the summit - California Education Leadership committee member +Rowland Baker who will be giving the keynote on the first day and +Jason Borgen, Program Director of statewide technology projects for school leaders in California. We have sessions about Google Apps administration and management, blogging, Chrome tips and tricks, mobile apps, as well as several advanced topics on Google Drive add-ons. Check out our complete session and speaker line-up here. If you don’t want to miss the must attend Google event this year, click HERE to take advantage of the early bird tickets before they ran out.